Oxford, CT (October 4, 2018) – Morse Watchmans, the world leader in key and asset management, is proud to announce the latest addition to their executive management team - Tim Purpura, security industry veteran and Chairman of Mission 500, will be joining as International Sales Manager. 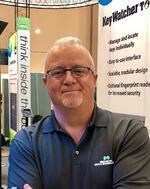 Tim Purpura has been an important contributor in the security industry for more than a decade, most recently as VP and Publisher at a leading security publication, Security Systems News (SSN). He also holds the positions of Secretary and Chairman of the Board for the security industry’s non-profit initiative, Mission 500.